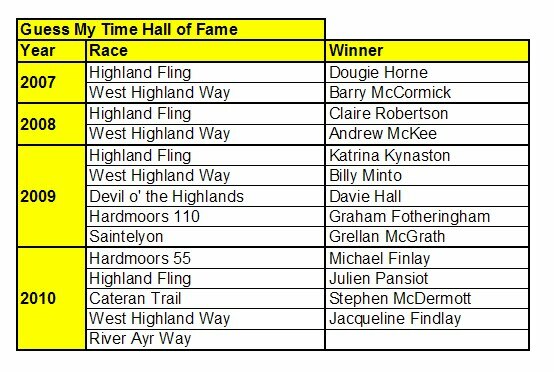 The River of Ayr race will be my fifth race of the year and my fourteenth ultra since I started in 2007. I feel it’s safe to say that I go into this one the most under prepared of them all. If it wasn’t for the fact that I want to complete four races in the SUM series I might have been a dns (did not start). But I feel my foot should be okay to manage 41miles. I’m not expecting to be able to push hard but my priority is to finish, hopefully score more than 135pts and end up 3rd in the Super Vets Category. Not too much to ask is it?? Anyway I didn’t want to spoil my sequence of doing my ‘Guess My Time’ competitions so it is now open for guesses. To give you an idea of what to go for the race is 41miles with some undulating parts but no real hills to speak of. Sharon, who tends to run similar times to me – well until this year, finished in 7hrs 02mins last year. Though she tells me she did get lost??? So my three goals for this race are …. For me this is the most important goal as if I don’t finish I won’t qualify for the SUMS. My fitness is not as good as I’d hoped it would be going into this race and so I feel I’d be very happy to get under 8hrs. Maybe everything will click on the day, adrenaline will kick in and I’ll run a lot better than I think I can but if I was a betting man I won’t put too much money on a gold. I can almost hear Stuart Mills screaming at his computer telling me not to be so negative! I’m normally pretty positive about my aims but as I think back to the last 5miles of Sunday’s run I know how tough it will be to run under 10min miles at the moment. So there you have it. Your mission, if you choose to accept, is to guess in hours, minutes and seconds how long it will take me to complete the RAW race on Saturday 18th September 2010. There will be a token prize but the bigger glory is to be added to my ‘Guess My Time’ Hall of Fame. No-one has two entries!! 7. Speak to me in person! 7 ways to contact me so no excuse! It’s now almost 10 to 7 and I’m waiting for Davie H to come and give me a massage which he feels should help with the problems I’m having with my foot. Report on how it went later or tomorrow if I can’t walk to the computer! This entry was posted in guess my time competition. Bookmark the permalink. 7:46 – Best of luck! 7:27:27 It's great that you're going to be there after your foot troubles. Have a great run.